How to get help with problems in VDMX. How can I get help if I have a problem with VDMX? If you are having trouble with VDMX and need to contact us for help, check out the support page. Sometimes when using VDMX you may run into issues that are easily solved. In this section we will list a few of the common problems that we’ve seen people run into and some suggested ideas on how to deal with them. Each project in VDMX is capable of containing multiple workspace presets that adjust the layout and rendering pipeline of your setup. 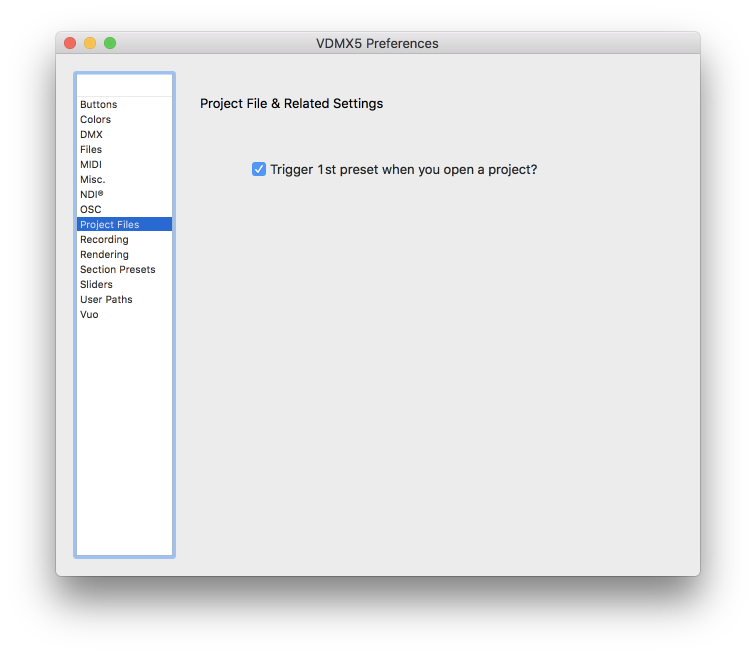 By default the first preset in a project is automatically launched when a project is opened. If your workspace layout does not launch with your project, make sure to check this setting is enabled in the VDMX Preferences. Connect external display to computer by HDMI / DVI / VGA cable. If needed (if the output on both screens is the same), disable the “mirror displays” option. If needed, adjust the screen resolutions for each display. Within VDMX, choose “Full-Screen Options” from the “Windows” menu. Use the toggle switches to select which display(s) are used for output. Usually screen 0 is where your interface shows up. Additionally, one other useful tip is that while in the System Preferences, you may want to go into “Mission Control” and disable the “Displays have separate Spaces” option – this will make it so that external displays do not have their own menu bar. 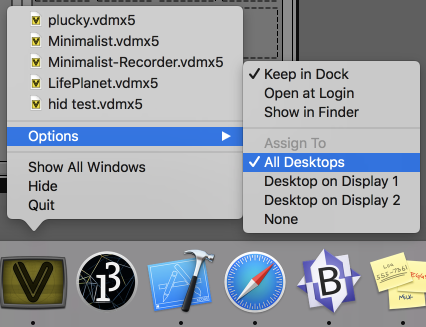 When using Displays have separate Spaces option in Mission Control and Spaces you may need to set VDMX to the “All Desktops” option in order for the fullscreen output to be displayed on secondary displays. This can be set by right-clicking on the VDMX icon in the dock. You can connect up to six displays to the 2013 Mac Pro – however there are some special notes for setting up multiple displays. See the Apple support page for more information. In the VDMX Preferences under MIDI, confirm that the device is detected and enabled. If the device does not appear in this list, confirm that you have any needed 3rd party drivers installed. Use the Comm Display plugin in VDMX can be used to display incoming MIDI data. Check to see if the device shows up and works with a 3rd party MIDI testing app such as MIDI Monitor. In the VDMX Preferences under OSC, confirm that you are set to receive on the same port that the data is being sent on. Over the Internet, make sure that your router is properly configured to forward the ports from your public IP address on the Internet to your local IP address. When supported, VDMX will detect other applications that support OSC using Bonjour (ZeroConf) services. If an application is not automatically detected, you can manually add the IP and port that you would like to send to. Note that while some applications like VDMX support bi-directional OSC messages through OSCQuery for the purposes of keeping UI elements visually in sync across software, it is an optional part of the protocol and may not work with all systems. The free OSCQuery Browser utility provides a simple interface for browsing available OSCQuery servers, displays their OSC node hierarchies, creates UI items for endpoints that advertise their type, and sends OSC data to the remote server when the UI items are used. Within VDMX, a built-in OSCQuery Browser window can be accessed from the Window menu (cmd+5 keyboard shortcut). Similar to the standalone OSCQuery Browser application, this window can be used to browse and quickly send OSC messages to a remote host. Additionally you can drag elements from the built-in listing to UI elements in VDMX such as slider and buttons to automatically setup OSC senders. Make sure the software / hardware device you are trying to detect supports the OSC Query Protocol extension. Make sure the server is on the same local network. ArtNet works best over an ethernet or other wired connection. You may experience choppy behavior or slow updating of DMX universes over WiFi. In the VDMX Preferences under DMX, confirm you are using the correct network device. In some cases you may need to go into System Preferences under Network to configure the IP address settings for an ethernet device. In the situation that your Mac is beginning to overheat, the system will automatically start to throttle the CPU usage of the system. As described on this Apple support page, this is usually observed by launching Activity Monitor and seeing a ‘kernel_task’ that is taking up a lot of CPU time. Overheating can be a common issue for live visuals, particularly at live events at outdoor festivals or in venues under hot lights all day. Make sure you aren’t blocking any of the fans on your computer. Try to improve ventilation, eg by propping up the back of a laptop or using a stand. Use an external cooling system, such as a laptop cooling pad. Quit any extra software and disable background processes that may take up any additional CPU time. VDMX optimizes the interface redrawing as much as possible, as they compete with the video processing to update on screen. In extreme cases (or on older hardware) it can make a noteworthy difference to throttle the rate at which UI controls that are visible in VDMX are refreshing. In the VDMX preferences in the ‘misc’ section is an option to throttle the UI Item Rendering FPS. The maximum number of layers of media that can be played back at once before you start to drop frames will vary depending on the resolution, video codec and the limitations of the computer itself. Your choice of video codec may depend on the particular needs of a project. For example, if you only need one or two layers, h264 or ProRes might be fine, but beyond that you may want to use HAP. Using a different codec that does not use “interframe compression”, such as HAP, ProRes or PhotoJPEG. Encode your h264 movies with every frame as a keyframe. It is recommended to use a fast hard drive (SSD or similar speeds) when using HAP and ProRes media files. See the notes on the video codecs page for more information on transcoding between formats. Triggering of movie files and still image files can be greatly increased by pre-loading them. This option can be found in the inspector for the Media Bin plugin under the ‘Options’ tab. Settings for live inputs such as web-cams, digitizers and screen / window capture can be found in the VidIn section of the Workspace Inspector. From the ‘Use Source’ menu in the ‘Layer Source’ window for a layer. The Media Browser window (from the Windows menu) can be used to add live inputs as clips to media pages to be triggered like other media files. Most off the shelf webcams and many digitizers will work natively with VDMX through AVFoundation. Check to see if the input appears using other software such as QuickTime Player X or Photo Booth. Confirm you have installed any 3rd party drivers if needed. If the device has choppy input or incorrect resolution, use the VidIn section of the Workspace inspector to adjust the capture settings. Make sure to install the latest Desktop Video software from BlackMagic. For devices that can do input and output, and are not ‘full duplex’, confirm that the device port is not also being as an output. Confirm that the device is not currently being used by other software that may have exclusive access to it. Some BlackMagic devices can automatically detect the format of an input signal. In other cases you may need to go to the VidIn section of the Workspace Inspector and manually set the resolution and frame rate of the input stream. BlackMagic hardware typically support HDCP and may not work with signals directly from DVD players, cable boxes or other devices that have protected content. NewTek provides a free set of useful NDI Tools applications for testing purposes. Make sure that the option in the Window menu titled “Lock Windows” is disabled. Make sure that the option in the Window menu titled “Keep windows on main screen” is disabled. If you are having an issue that is not covered on this page, check out the support page for ways to get in touch with VIDVOX for help. When using the built-in bug and crash reporters we will automatically receive the basic system specifications and console logs that are often useful for us to diagnosis a problem. A simple project file or clear set of steps we can follow to recreate the issue on our end. Screen captures, images and video. Any relevant media files that we may need to recreate the problem. Typically the sooner we can reproduce an issue on our end, the faster we can fix it!